Home » Experiences » What’s it like to win your own private jet? What’s it like to win your own private jet? I’d stumbled across a competition in London’s Evening Standard last April for “1 lucky winner and 49 friends to fly to Stockholm in their own private jet!”. 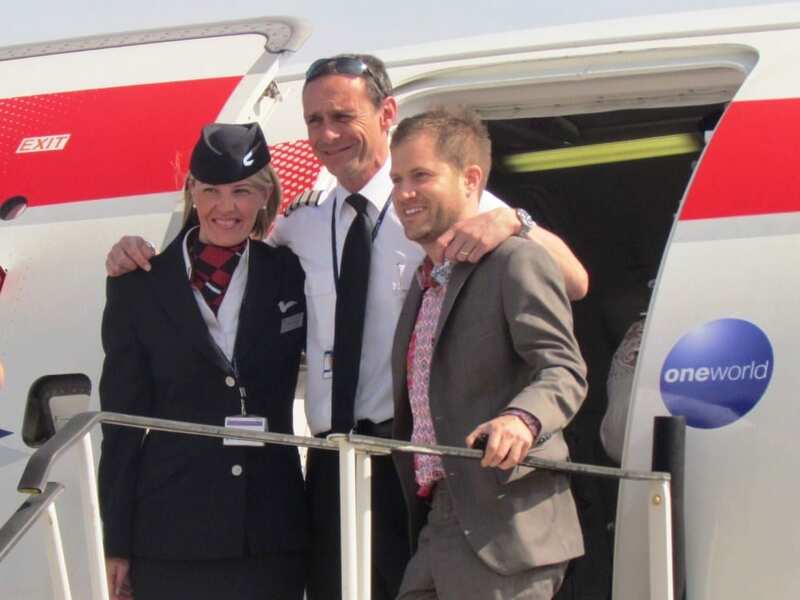 This was to celebrate 10 years of British Airways flying out of London City Airport. To enter all I had to do was provide a “fact” about Sweden! My Swedish friends’ suggestions included facts on wars, blonde hair and Volvos. So I ignored all their suggestions and instead went with this one.”The @sweden twitter account is given to a different Swede each week!” Answer submitted, browser closed and back to the remainder of my London commute. Looks like I’ve won my own private jet! Just two weeks later I received a call confirming I’d won! They said they’d been trying to get hold of me all week and were only going to give me one more day to pick up (the perils of not answering your phone when it says “Unknown number”). So both relieved and excited they confirmed the prize to me with a little bit of convincing – a British Airways private jet to Stockholm for me and 49 friends, transfers on the Arlanda Express, 25 four star hotel rooms in the Clarion Sign hotel, a Stockholm sightseeing card plus a free trip to the newly opened ABBA museum. 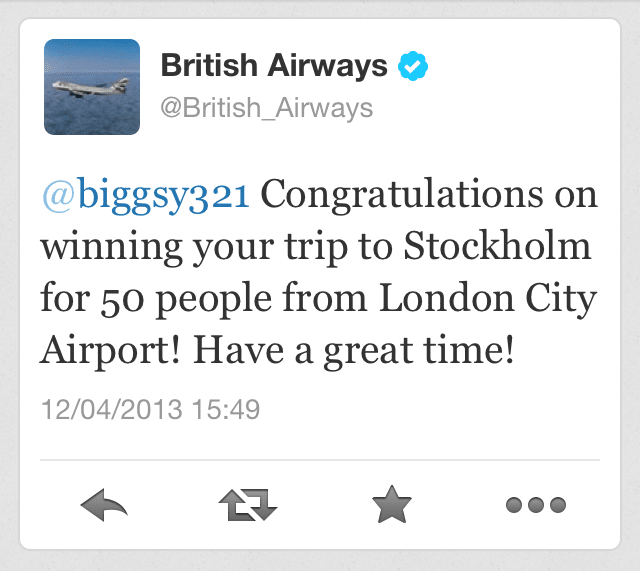 However not until I’d spoken to both British Airways and VisitSweden was I sure that this wasn’t a hoax! A tweet from the official BA site was the proof I needed. A British Airways Tweet confirmed it! This process consisted of scribbling down lists of different groups (work, home, school, sports club etc). To reduce the chance of any mishaps and dramas on the day I tended to exclude friends who couldn’t easily get to London or had small families to juggle. Sorry! 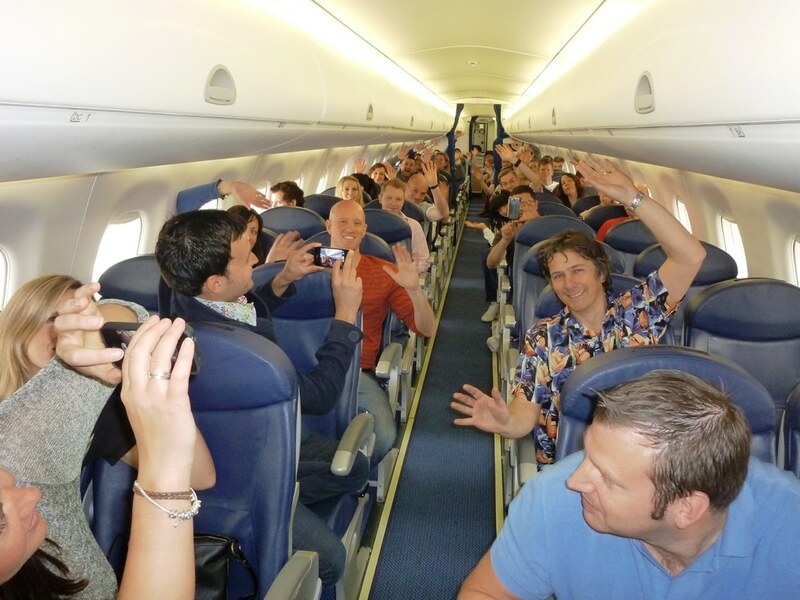 One friend even suggested I fill the whole plane with dancers from Spearmint Rhino, but making sure he was included too! So lying back on the sofa, iPhone in hand, decisions made, my template Facebook email was sent out to 49 lucky recipients and within 2 minutes the replies begin to roll in – my Facebook message notification symbol was in overdrive! Most people assumed I’d been hacked! Is this all actually about to happen? Fast forward two weeks and the seats have been filled after a surprisingly high number of 108 invites. When somebody said “no” another person found themselves invited. The “no” replies were mainly due to other planned trips, work commitments (especially for teacher/police friends), friends whose partner’s passports had lapsed (careless! – just go without them surely? ), job interviews and the fact it was a Thursday to Saturday trip requiring two days off work. Of course those who made the trip will never know if they were in my top 49 list or not! All aboard! My lucky passengers! On the big day itself! …it should get a little mention. 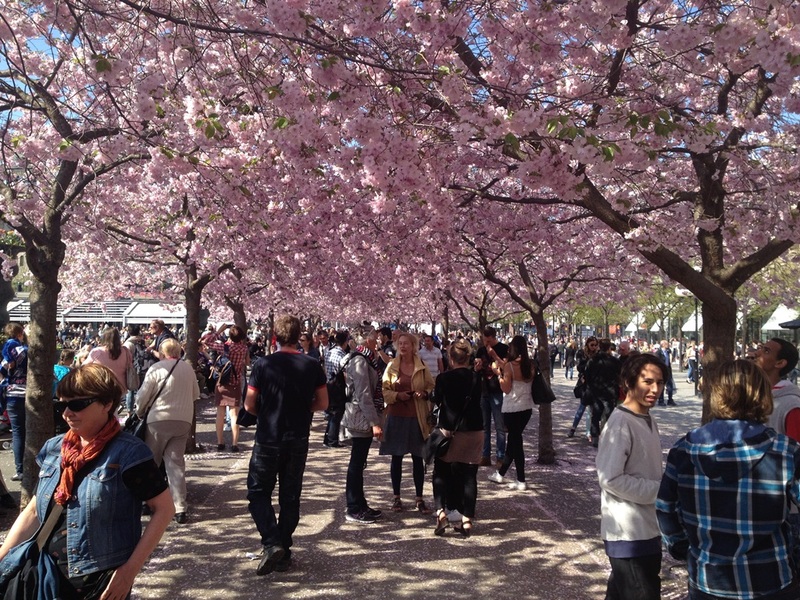 It was sunny, beautiful and full of sunbathing Swedes. With much good fortune it was their first proper warm day of the year. The newly opened ABBA museum had some great interactive exhibits and lots of recognisable memorabilia too. This included ABBA’s famous outfits from the 1974 Eurovision competition. If you visit definitely check out the Vasa Museum, the Gamla Stan and the numerous boat sightseeing trips that go around Stockholm’s 14 beautiful islands. Up until this big prize I’d only ever won one travel competition. That was a trip to California after entering a Twitter competition at a travel meet-up in London. Subsequently I found out only 7 people had entered it! Yes – the chances are slim but this post proves that it does actually happen! My tips would be to enter competitions on Twitter (fewer people enter). Enter competitions at meet-ups (even fewer people enter). Throw your business card into those goldfish bowls in bars/pub. But for bigger competitions like this Sweden one … that require that little bit of extra effort … and you never know your luck! Check out my top tips for winning travel competitions. What a great story and prize to win. Fabulous answer to the competition too, I can see why your answer was chosen to win.